In the US, the holidays have come and gone, the Superbowl is approaching, and Americans en masse turn their collective attention to that most unique of sports—American football. For citizens of many countries, the American fixation with football can seem strange. Why do so many Americans share a love of watching hulking men form lines and bash into each other while slightly less hulking men toss, run, or kick a ball downfield? What motivates grown men to stand in sub-Arctic temperatures shirtless, fully painted and wearing funny hats? And who are these fanatics that turn every Sunday afternoon in America into a feast of chicken wings, beer, and pork rinds? To answer this and many more questions, we will consider 5 American football fans in all their glory. Powers and Abilities: Extreme Temperature Resistance, Face/Body Paint Expert, Superior Bladder Control. 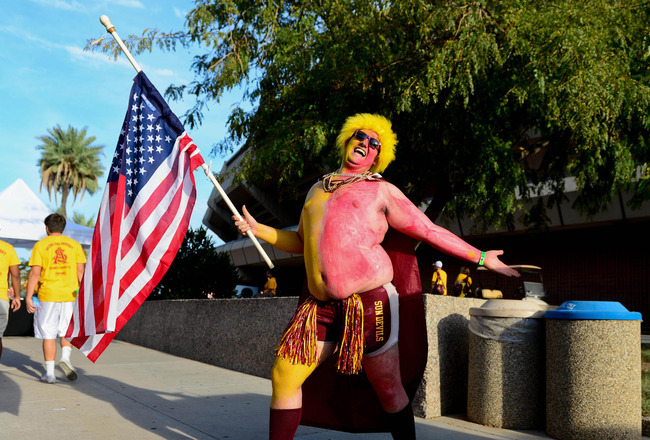 The Superfan comes in all shapes in sizes, but is typically round. Every team in every city has one or more individuals who are willing to trade comfort and dignity for the sake of their cause. Body paint, wigs, elaborate costumes and jewelry—the Superfan will always go the extra mile because no matter how bad their team is, THIS IS THE YEAR THAT THEY WILL WIN THE SUPERBOWL!!! 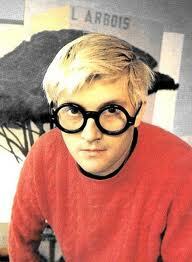 As mentioned, many superfans maintain an exceptional level of girth. This diet likely evolved as a response to the need for maintaining high core body temperature when shirtless outside in freezing weather. Nutritionists we consulted with attribute this to living on a steady diet of soft pretzels, nacho cheese, Bud Light, and blind hope. You: Oh great, let me Google that. What team were you playing against? You: And you were quarterback, right? So I should see your name pop up when I search for….Harry? 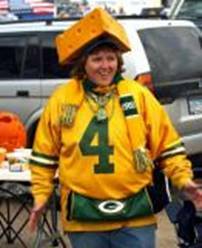 The Cheesehead, although prevalent throughout America, mainly resides in the city of Green Bay, Wisconsin, and is a fan of their hometown team, The Green Bay Packers. 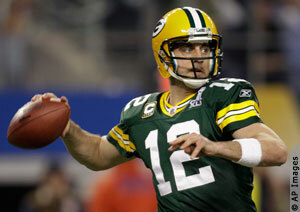 The Green Bay Packers were originally named after their sponsor, which was a meat packing company. Naturally, they wear massive slices of cheese on their heads. Don’t ask. Even when including the population of the surrounding Metro area, Green Bay has a total of about 280,000 people, but manages to support one of the most successful NFL franchises of all time. To put that in perspective, imagine a city about 1/3 the population of Jos supporting a massively popular and successful professional soccer team. 280,000 people who willingly buy foam rubber cheese hats, and wear them regularly. It’s those brilliant marketing skills that allow an NFL franchise to be supported by such a small community. Next up: Green Bay Packers Official Bottled Air! Habitat: The parking lot of any stadium. The term ‘tailgate’ in America technically refers to the open back of a flatbed truck. In reality, you will hear it used to refer to these golden gods of American football, Team Tailgate. Nomadic in nature, they will travel to any stadium, anywhere in the USA to cheer on their team. However, much like a tuxedo t-shirt, they’re not just there for appearance—they’re there to party. ‘Tailgating’ when used as a verb refers to precisely what you see above. 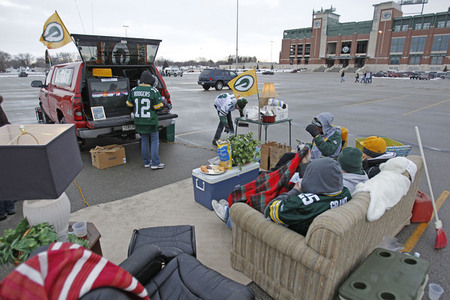 Groups of fans huddle together in back of a truck, set up couches, chairs, grills, radios, and in the case above they also brought lamps and a TV to complete the look. Whether or not they actually enter the stadium is far from the point. Team Tailgate is there for the party. They are easy to spot, as they travel in packs and are often identified by following the smell and smoke of grilled meat in a parking lot. Fantasy Football has taken America by storm in recent years. Despite the name, it does not involve unicorns and wizards. Yet. At the start of each season, groups of friends get together and draft fake NFL teams. They then spend the entire football season charting the individual statistics of their players, and score ‘points’ in the fantasy league based on the individual performances of the players in the fantasy world as they actually perform in the real world games played. Sound complicated? That means you’re normal. Fantasy Man can be found in nearly any office, or in any group of friends. Football purists bemoan this new species, as Fantasy Man does not cheer for any team. Rather, he will cheer on the individual performance of many different players scattered across many different real world teams that comprise his fantasy team. The first lesson of American Football is that team loyalty is tantamount. For example, if you are a Cleveland Browns fan, then buckle up for a hard life but a true fan always gets respect for sticking with their team through good times and bad. Fantasy fans are commonly viewed as computer geeks who are taking the joy out of the game and valuing individual performance over team loyalty. Of all the fans, Fantasy Man is the hardest to notice, as even when he leaves his mother’s basement to watch a game in public, he is often spotted obsessively checking his smartphone and multiple TVs for more and more data. Now that you have a better understanding of American football, take the opportunity to reach out this year. If you notice a sad Cheesehead whose Packers just lost, take a moment to compliment their…um…unique choice of headgear. If you encounter a member of Team Tailgate wandering aimlessly around a parking lot, guide them back to the hive. And if you encounter High School Harry, just nod and say yes. Humor him. It’s the least you can do. We hope you enjoyed this tour through Americana and will have much more on the way for you in the coming months. Maintenant, le superbowl est ici et je vais regarder tous les matchs de football américain sur internet. C'est le seul sport qui a la pleine aggresion et amusant. Quand ce jeu est disponible en haute définition ce qui est beaucoup plus agréable à regarder. I am one of American football fanatics at the time Soccer. Thanks for sharing the links @amit singh. These are really interesting links and all are useful.